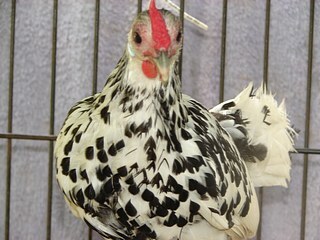 Hamburg Chickens are great looking birds and prolific layers of small white eggs. They are also excellent foragers. Comb, Wattles & Earlobes: Red rose comb covered with small points; moderately large, white earlobes close to head. 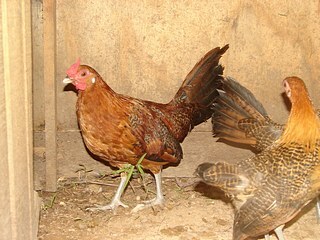 Red, well-rounded wattles are medium size in males and small in females. Color: Dark horn beak with grayish blue shanks, unless otherwise noted. They have pinkish white bottoms of their feet. All have reddish bay eyes. Blue Hamburgs are not recognized by the APA, though they are sold by several hatcheries in North America. Black: Standard black plumage. Black beak and black shanks. Golden Penciled: Standard golden penciled plumage. Golden Spangled: Standard golden spangled plumage. Silver Penciled: Standard silver penciled plumage. Silver Spangled: Standard silver spangled plumage. Special Qualities: An excellent forager. A very good layer of small white eggs. The origin of the breed is a debated topic. Most believe that the breed originated in Holland, but a renowned poultry historian believes that the breed is very old and comes from the area of Turkey. He believes that the breed began being transferred to Holland and Britain as early as the fourteenth century. These birds are stylish, active, and are actually excellent flyers for a chicken. They have a keen foraging ability and will do very well in a barnyard or backyard setting. They do not do well in confinement. They are known for their cold hardiness and the hens are early maturing and excellent layers. They were admitted into the APA in 1874.